Hyperion have an enviable back catalogue to draw on for their Helios reissues series. And one of the most interesting and consistently accomplished performers in their roster is Graham Johnson. 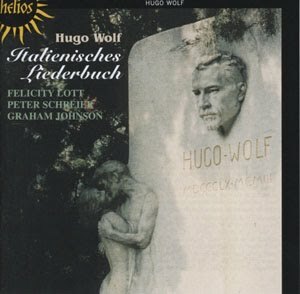 Throughout the 1990s, Johnson produced a steady stream of impressive lieder recordings, and the prospect of their reappearing at budget price is tantalising indeed. Astute collaboration choices are the secret of Johnson's success, and the singers he has chosen for the Italienisches Leiderbuch could hardly be bettered. True, the combination is a strange one – a venerable, and certainly mature, German tenor, with a younger, but no less accomplished English soprano. But all the songs are underpinned by Johnson's sympathetic and always distinctive accompaniment, maintaining a solid, coherent basis for the cycle. Felicity Lott takes a liberal approach to the interpretation of her songs. Guttural vowels towards the bottom of the register often give her tone a rich, earthy quality. And she's not above putting in heavy rubato slides when the more sensuous passages allow. But these are occasional effects, and while her tone is always well supported, the overall impression is of bounce and agility. Listen, for example, to her rendition of 'Nein, junger Herr...', there is some quite extreme legato here, and it's saucy too, verging at times on Kurt Weill, but the short song is carried by the lightness and bounce of Lott's tone. Magnificent. By 1994, Peter Schrier was in his late 50s, and that certainly shows in his performance here. In general his voice is still well supported, and there is a valuable burnished quality that is a compensation of age. But there are moments of frailty as well. The forte conclusions to many of the songs, 'Ein Ständchen...' for example, challenge his voice and threaten the round timbre. In some of the songs, such as 'Ich leiss mir sagen...' his voice sounds like it is on the very edge of its comfort zone, a product of physical frailty I think, but used to valuable artistic ends. Then there are more delicate songs, such as 'Geselle, woll'n wir uns...' where we are returned to the Schreier of the Moore and Richter collaborations of the 60s and 70s; the years have clearly been kinder to the singer's piano tone. My complaints are mild though, and the benefit of experience, especially in terms of interpretation come close to compensating for any defects of tone. I should also add that his intonation is spot on throughout, and his phrasing is masterly. Graham Johnson is not a shy accompanist, but then nor does he vie for the limelight. There is a luminosity to his tone that energises each of the songs. The way that he phrases in sympathy with the singers is impressive, as his ability to maintain the clarity of the accompanying lines without bringing any of them to the fore. The church acoustic seems a curious choice for this repertoire, but it is not unduly resonant, and the roundness that it brings to the sound, especially to the piano upper register is ideal. Hugo Wolf was a troubled soul, and even in this, one of the lighter of his cycles, you are never far from the next dark cloud. The success of this interpretation lies in the performers' ability to juggle those two sides. Of course, we are not talking about Winterreise here, so it is just as well that all those darker emotions remain firmly in the background for most of the time. It is a disc of expressive and intimate Wolf songs, performed by consummate performers and recorded to the highest audio standards you could want. Well worth a listen.